In this lively book, Benedict R. O'G. Anderson explores the cultural and political contradictions that have arisen from two critical facts in Indonesian history: that while the Indonesian nation is young, the Indonesian nation is ancient originating in the early seventeenth-century Dutch conquests; and that contemporary politics are conducted in a new language. Bahasa Indonesia, by peoples (especially the Javanese) whose cultures are rooted in medieval times. Analyzing a spectrum of examples from classical poetry to public monuments and cartoons, Anderson deepens our understanding of the interaction between modern and traditional notions of power, the mediation of power by language, and the development of national consciousness. 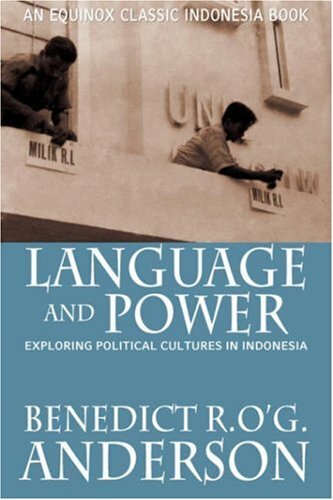 Language and Power, now republished as part of Equinox Publishing's Classic Indonesia series, brings together eight of Anderson's most influential essays over the past two decades and is essential reading for anyone studying the Indonesian country, people or language. Benedict Anderson is one of the world's leading authorities on Southeast Asian nationalism and particularly on Indonesia. He is Professor of International Studies and Director of the Modern Indonesia Project at Cornell University, New York. His other works include Imagined Communities: Reflections on the Origin and Spread of Nationalism and The Spectre of Comparisons: Nationalism, Southeast Asia, and the World. If you have any questions about this product by Benedict R O g Anderson, contact us by completing and submitting the form below. If you are looking for a specif part number, please include it with your message.